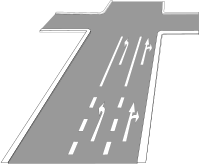 The key turn can be used to specify the direction in which a way or a lane will lead. Magic Earth navigation supports turn:lanes. OSM2World uses turn:lanes to render 3d roads with painted road markings. This page was last edited on 21 April 2019, at 10:20.